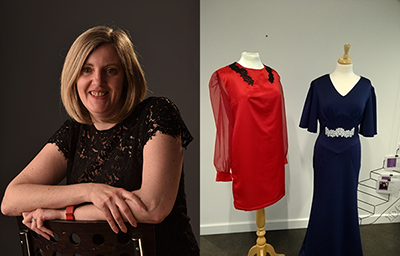 Dundee entrepreneur, Karen Hamilton is a designer and a bespoke dress-maker creating tailored bridal and evening wear. As an independent fashion designer, Karen offers a unique service that means her outfits are made to fit the customer rather than a generic size that does not exist. Taught by her grandmother how to sew since the age of five, and with over 30 years’ experience of dressmaking and garment construction, Karen was keen to further develop her recently launched fashion business. While studying for her Higher National Diploma (HND) in Textiles, Karen began to experiment with 3D printing and was keen to explore new ways of how it could be used within the creative industries sector. The entrepreneur began developing lace designs for printing and managed to print 3D lace samples and collar pieces which could be added to garments. Previously, designers have developed component pieces that can be joined together to create clothing or component parts. However, Karen wanted to develop this further and produce a prototype using different printing filaments which would allow her to print unique lace designs that can be used as a textile. Karen’s pioneering idea was that the lace fabric would be printed in a single piece and not printed in component parts that are then joined together. By using all recycled materials to produce the prototypes and because the design will be printed to the shape, there would be no material waste. This is a new innovative use of an established printing technique as no other company or designer is using the technology to produce textiles with the potential to transform the industry. Therefore, academic support was required to access the specialist equipment and resources to develop a lace textile that is flexible, could be easily adapted and printed quickly by using 3D printing. Karen’s project was successfully awarded a £5000 Scottish Funding Council (SFC) Innovation Voucher, administered by Interface, which enabled her to collaborate with Dundee and Angus College to access their specialist facilities. The Learning Lab at Dundee and Angus College, which is a space promoting the use of innovative technology through hands-on learning, with the support of learning technologies staff, provided Karen with guidance, expert knowledge and practical supervision of the use of equipment. Dundee has always been a hub for design and innovation and in December 2014 it became the UK’s only UNESCO City of Design. The city has a long-established connection with the textiles industry, dating back more than a century. This collaboration allowed me to develop a unique and innovative prototype, which can show alternative uses for 3D printing. My business has a unique selling point and offers a service that no other dressmaker or designer is currently offering in Scotland. From the perspective of the College, this is an example of cutting-edge research and development activity within the digital field in respect of commercial fabric design and construction and depending on outcomes, could inform future curriculum content and afford student project opportunities. The project has provided an excellent opportunity to engage in applied research- something not normally associated with the college sector - using internal resources and academic staff with expertise in digital and related areas of work activity. It represents a fine example of commercial and academic partnership and will serve as a good model for future collaborations. Earlier this year, Karen joined some of the best and brightest talents in the city and presented her first ever collection on the catwalk at Dundee Fashion Week. The impact of the project has the potential to change the way how textiles can be manufactured in Scotland/UK and Karen Hamilton is going from strength to strength with additional support through Zero Waste Scotland. There is also a societal impact to create a new form of textiles industry within Dundee and being able to develop a saleable product that can be produced directly by Karen’s business, to create jobs within the city for digital production as well as manufacturing 3D printed textiles. The novelty and success of the project (in terms of producing a physical artefact) has also generated interest and welcomed publicity for the Dundee and Angus College as a participant in the Scottish Funding Innovation Voucher scheme.